One, single communications solution, with global connectivity and complete compliance assured. One, integrated omni-channel cloud software platform for all communications, with compliance issues resolved and future proofed. A leading global FinTech provider, offering state-of-the-art CFD trading platforms and solutions. FINSA is a leading global FinTech provider, offering state-of-the-art CFD trading platforms and solutions across all devices. FINSA services financial trading partners in the UK, Europe, Asia and South Africa and are regulated by the Australian Securities and Investments Commission (ASIC) and the Financial Conduct Authority (FCA). Allow employees to access the service from any location. Record and archive all client-facing communications to satisfy MiFID II, GDPR, PCI DSS and all FCA and ASIC regulations. Streamline communications and compliance through a single platform to reduce cost and complexity. To comply with FCA regulations, organisations in the Financial Services sector must record and archive all client-facing communications. Under MiFID II requirements, this data must be recorded and stored for 7 years, and easily retrievable within 72 hours. With a key portion of their business within the EU, FINSA also had to meet the rigorous consent, storage and processing standards set out in GDPR from May 2018.FINSA needed a solution that would future-proof communications compliance, ensuring adherence with existing and impending regulations. Delivering a superior customer experience required the ability for FINSA sales and customer success teams to communicate with clients across a variety of channels and platforms – from voice and video calls to e-mail, conferencing and third party apps. However, the more communications channels used, the greater the compliance headache.FINSA needed to ensure they could easily meet compliance across all the channels they used to engage with clients and prospects. Currently, FINSA have teams based in the United Kingdom and Australia, as well as staff across the globe on business. Replacing separate communications and compliance systems spread across offices and regions with a single platform would cut cost and boost efficiency.With personnel numbers growing and operations expanding, FINSA needed an integrated cloud solution that client-facing mobile teams could access through their internet connection. The decision to on-board the Solgari integrated omni-channel communications platform allowed FINSA to satisfy their three key objectives and avoid the expense and complexity of multiple cloud vendors. 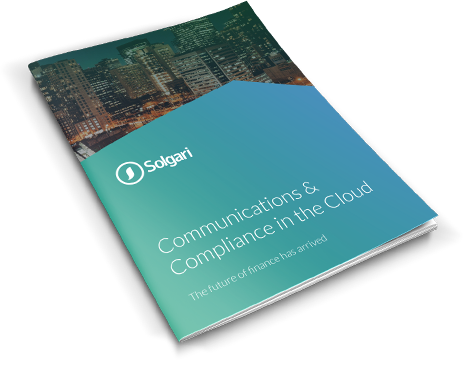 Solgari enables FINSA to secure its recorded data in a military-grade, 1024-bit encrypted cloud environment, both at rest and in transit, which not only meets but exceeds FCA, GDPR, PCI DSS and MiFID II requirements. All of FINSA’s communications channels are integrated with the Solgari platform and CRM. Now, no matter how the FINSA team communicates with clients and prospects – voice call, video call, e-mail, third party apps, IM, online chat, social media and more – each customer engagement is recorded, archived and made available for monitoring and analysis through the Solgari platform. The introduction of the Solgari platform has also eliminated the need to log in separately to each communications channel. Each can simply be accessed by the FINSA team via the Solgari desktop, mobile or softphone application. By using the Solgari platform with an IP Deskphone, online softphone, web application or mobile app, FINSA teams can communicate with customers and colleagues across a global network of offices where the platform is deployed. An internet connection is the only requirement to access all features and functionality, meaning that FINSA teams can continue to make compliant customer communications even when travelling. The communications data is shared from multiple sources across multiple systems and can be accessed in real time by all employees, regardless of location, language or time zone. FINSA’s trading platform is available to brokers in multiple countries worldwide. We have a number of regulatory communication requirements, including being able to archive all communications to meet ASIC, MiFID II and FCA compliance. Finally, with Solgari, we are now able to access all these services on a single cloud software platform.